I visited my Mother today and I came to the right Time because her Husband did cook. They then asked me if I want to eat something too. I indeed couldn´t say no. 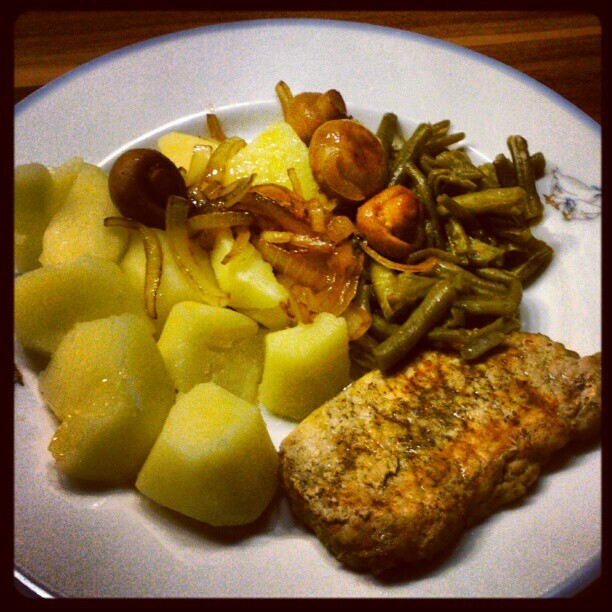 😉 He cooked Potatoes with String Beans, Onions, Mushrooms (Champignons) and Pork Steak. It was pretty tasty, however I missed a Sauce. I prefer eating most Things with Sauce. While I know they and a lot of other People eat the mentioned Dish above without Sauce. I still liked it too. I especially love Mushrooms pretty much!